The Cox School of Business was founded in 1920 as the result of requests from the Dallas business community. 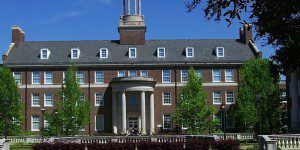 The school was named the Department of Commerce at Southern Methodist University. The school was renamed the School of Commerce in 1921. The School of Commerce was made a separate entity of Southern Methodist University in 1941 and was renamed the School of Business Administration. The Graduate Business Program was started in 1949, when the school began to offer the MBA program. In 1978, the SMU School of Business Administration was renamed the Edwin L. Cox School of Business. The school was named in honor of Edwin Lochridge Cox, a business leader, entrepreneur and long-time supporter of SMU. The school is AACSB accredited. 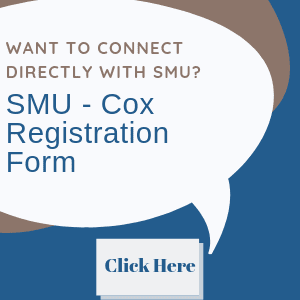 The Cox School is located on Southern Methodist University’s 237-acre main campus five miles north of downtown Dallas. The school opened a second campus located in Plano, Texas in 1997. The Plano campus is located in Legacy Business Park off Tennyson Parkway. The campus is set on 16 acres with four buildings and nearly 200,000 square feet of space. The James M. Collins Executive Center houses the Executive MBA and other Executive Education programs. The center features state-of-the-art technology and a variety of flexible spaces for learning and events. The Crow, Fincher, and Maguire buildings house classrooms and faculty and administrative offices for the Cox School. The buildings are also home to the Business Library, the Kitt Investment and Trading Center and the William J. O’Neil Center for Global Markets and Freedom. The business library offers both individual and group study areas, computer areas consisting of 70 computer workstations, a multimedia studio, a group presentation room, 480 electronic research databases and a variety of print resources, including the Edwin L. Cox Business Leadership Center Resource Collection, the Cary M. Maguire Energy Institute Resource Collection and the Career Management Center Library. Students at Cox also have access to the MBA Career Management Center. The Career Management Center (CMC) partners with MBA candidates, alumni and employers to build relationships to develop successful career plans for students. As of 2016 there were 81 teaching faculty members at Cox. Faculty at the school includes graduates of such high-ranking business schools as Wharton, Stanford, University of Chicago and Harvard Business School. According to one study by the Academic Assessment Services, the faculty is ranked in the top 30 business schools for productivity in research among business schools worldwide. The student population at the Cox School of Business is 65 percent male and 35 percent female. Roughly 30 percent of the students enrolled in the full-time MBA program are international students and around 20 percent of the students are of minority status. The Cox School of Business offers full-time MBA, Fast Track MBA, Professional MBA and Executive MBA programs.